A couple of days ago I received a phone call from my sister in law concerning the death of her fighting fish ( Betta splendens ). She explained to me that her fish, which she had only for a week, developed cottony stuff on its body, torn fins, and that it turned a pale color before it died. After some questions from me I found that she kept the fish in a small bowl, and that she made sure to feed it every day. She was clearly upset, and wanted know why her fish died. I’m aware of the fact that many people keep Siamese fighting fish in small bowls for years, but those people know how easy it is to pollute a small bowl by overfeeding, and act accordingly. It is my educated guess that my sister in law overfed the fish to the point where the water in the small container became toxic due to decaying food. I’m not interested here in discussing the ethics of keeping Bettas in small containers or even discussing stores that sellBettas to the general public, without providing information about how to keep the animal healthy. However, the phone call got me to thinking about how we feed our animals in our reef tanks, and I began to wonder what governs our feeding regiment. Some of the editor’s hungry fish. To put it another way, is the quantity we feed determined by our desire to feed our guests because it’s satisfying to us, or to keep our aquatic guests healthy? Most experienced reef keepers know that for a reef tank to be successful it is necessary to maintain a balance between the produces and consumers of metabolic waste. Toward this end we use protein skimmers, live rock, sand beds, water changes, and lately macroalgae refugiums. Even with all of this, if we have too many fish, or feed too much, orthophosphate and nitrate levels begin to rise beyond those levels found on a wild reef, and may even rise to the point where our corals begin to suffer, and nuisance algae begins to flourish. I must confess that I love to feed my fish, and in general I try to feed enough so that the most undernourished fish gets enough to eat. Even though mine is a 10-foot tank, I have a lot of large hungry fish, and consequently have had my own battles with nutrient buildup. There are limits to how much waste removal even the devices – and I use them all – listed above can have. It is clear to me that feeding is a problem, and that the reef keepers who are very careful not to over feed have the least problems. One thing that I have done, and recommend to others, is to skip feeding one day a week, then another day, and it may be that eventually you will discover that you can feed your guests every other day without any suffering from malnutrition. Of course, it is important to carefully observe your fish to be sure that none are suffering. The bottom line is that I suspect that our fish need less food then we think to remain healthy. For our first issue of the New Year we have a new Beginner’s columnist. J. Warrick professionally setups and maintains aquariums and ponds of all types. 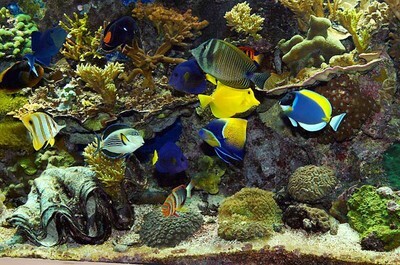 In his first column, entitled Advanced Beginnings, he discusses the considerations involved purchasing one’s first reef tank. Welcome aboard, J. Warrick. Also in this issue we use some videos for the first time. There are several video clips in the Featured Aquarium. Please be aware that if you are using a dial up modem viewing these video may be time consuming to download.